I have been made aware of the fact that perhaps content on this blog is too gyno-centric. Or, I talk about chick stuff too much. That said, I have invited a few of my readers to help contribute to this – the first post on men’s fashion. Looking at a Men’s Street Wear article from The Telegraph, each of us will give our initial impressions on pieces that are everyday, good looks for dudes. Gustavo: Houstonian – Cambridgite – NYer, my BF and arbiter of all things gentleman-like. Able to design and build structures, take breathtaking photographs while being the most stylish man at the party. The only person I dare not buy clothes for and who understands that good shoes cost good money. Mike: Proud native of Lubbock and always appropriately dressed. Legal wizard and fellow-blogger (www.newthingmonday.com). Believes that people should be comfortable and that clothes don’t make the man. Confused by men’s pointy shoes and not convinced that people should wear black all the time. Jessie: 100% suburban working mom, with a style that has been described by some as “all her own.” If it can’t be put in the washing machine, she won’t wear it, and she believes the invention of high heels was originally more about corporal punishment than fashion. Gustavo: Blue sweater with pegged pants has a laid back feel. Very everyday. Get rid of the hat and beard. 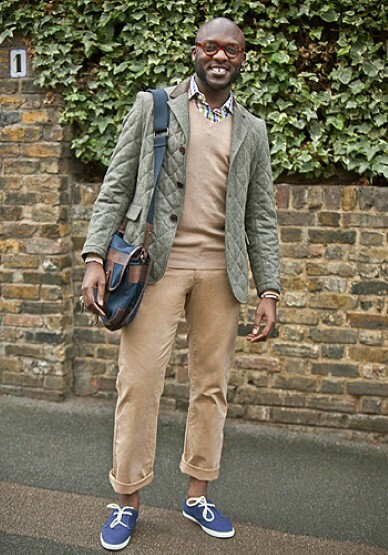 Try different colored brown shoes and switch the pant and jacket fabric around. Mike: His feet are going to stink – those shoes won’t breathe well and he has no socks. He’s also going to get blisters if he walks around much. I haven’t seen the other pictures yet, but if they all involve guys standing in very unnatural poses, I’m going to have to work to not ridicule that. Because when I look at this picture, the thing that keeps popping into my head to me is “people don’t stand like that.” I can’t exactly put my finger on it, but there is just too much going on here. Striped sweater, wrinkled sport coat, pants rolled up, shoes that kind of stand out in relation to the outfit and the hat. I think the only reason a guy should roll his pants up is if they are too long and he has not had a chance to hem them up, or he’s going to be wading through some water. In this case, he does not appear to have his wading shoes on and I assume that someone around for this photoshoot could have hemmed them. This just looks like this guy really wanted to show off his ankles. Jessie: I adore the hat. So very much. I honestly think EVERY man should wear a hat like this. 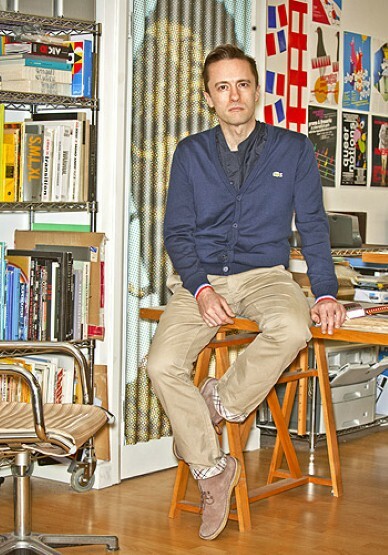 The jacket is working and the stripes keep it casual. You can’t go wrong with classic khakis. Unless, of course, you roll them up at the bottom and show off your ankles along-side bright-orange grandpa shoes. But he kind of makes up for it with that fabulous beard. Joy: I cannot deny that I am a fan of the ubiquitous Picasso striped nautical sweater. I adore a man who can paint a 20’ high canvas and sink my battleship. Only question: donde esta El Topsiders? Gustavo: The bag and coat — not good. Other accessories look good but the pants should be a different color and he should wear a brighter sweater. Mike: He made this jacket out of a bedspread. Again with the rolled up pants and no socks? At least these shoes will breathe better. His feet might not stink when he gets home at the end of the day. I think what is throwing me off about this, is that up top he appears to be dressed for a somewhat chilly day – three layers, a long sleeve sweater and the jacket. You look down and he’s dressed for a walk on the beach, but he’s carrying some type of satchel that doesn’t look like it holds his beach stuff. I am distracted by trying to figure out what this guy is dressed for? The pants do look pretty comfortable though and this guy looks comfortable so overall, I’m glad he’s wearing what he’s wearing. If I saw him walking down the street, I probably would not even notice anything about what he’s wearing so it passes the Springer test of not standing out. And the satchel seems a little dressy for the outfit. Jessie: I’m so in love with the bright-colored-collar/sweater-vest/quilted jacket combo. I even love his blue shoes, and the way they exactly match the blue in his plaid shirt. What I’m NOT loving is the flood-expectant pant style. Also, his man-purse looks a lot like my mother’s mom-purse. Just sayin’. Also, I think those glasses need to go back to the 70’s where they belong. You’re a good lookin’ guy. Don’t do that to yourself. Joy: Why hide your fun colorful shirt, Mr. Academic? Do you think that boring on the outside and fun on the inside will help you get that tenure track position? I think you could probably flirt with the Dean a little bit more. Gustavo: In general, this is pretty blah except for the farmer ascot which is not good. Mike: Does he have a neck wound? It looks like he has a bloody bandage tied around his neck and it looks to be tight – that can’t be comfortable and may even be dangerous. By my calculation this guys jacket, pants and briefcase cost $3,900US. What????? My first two pickup trucks combined did not cost that much. The pants look flimsy. Like they’ll tear if someone brushes up against him on the street. They also look kind of odd because they’re so narrow at the bottom. They almost look like pajama pants. It makes his feet look too big for his body. The bag is definitely close to being a purse (not that there’s anything wrong with that). And the color of his shoes doesn’t really go with anything he’s wearing – they do almost match his hair though. There’s just too much red on this guy’s head and neck. Maybe that’s on purpose to distract from the fact that he’s wearing skinny pajama pants. Joy: Ole! I hear Pamplona calling. Wave that red scarf around he could run with the bulls after a long day at the office. Gustavo: The coat is an interesting idea but not with the baggy jeans and drivers. Drivers are for 65 year old guys who stay indoors and jeans should be more tailored. Try another sweater – it doesn’t work. Mike: I don’t know what’s more distracting, that lonely Guinness sitting there needing me to drink it or the ridiculous number of buttons on this guy’s coat. There’s a lot of blue here. I thought these might be jeans and my only thought about them was that they are tapered too much so there’s all this narrowness and then his feet (in white, white, white) stand out too much. It looks like he’s wearing some kind of old man’s slippers and all I can think of when I look down at his feet is how amazingly white they are. This guy also looks pretty comfortable and so I like the look overall. 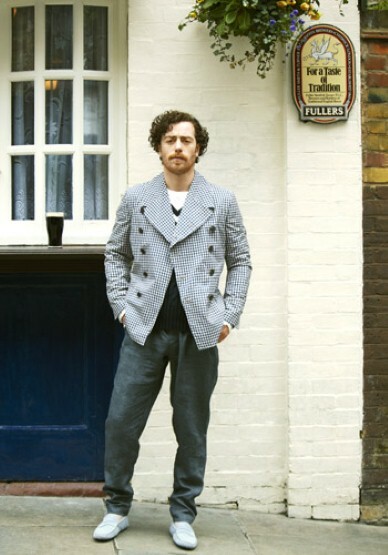 I think the jacket is a little too much with the buttons and the pattern. From far away it’s not as noticeable, but it might make you dizzy if you were sitting close and stared at it too long. I am trying not to dwell too much on the price when I look at these, because I assume these are clothes made by expensive designers, but these “linen tropical army trousers” are $1,975US. It looks like this guy is going to the pub to have a few drinks with his mates and possibly talk up some ladies. He’s going to get beer spilled on those $1,975 pants and be disappointed. Why would you wear something that expensive to the pub or pay that much for something that is casual. To me these don’t look any nicer than a $180 dollar pair of casual pants from Men’s Wearhouse. Jessie: I’ll get this out of the way fast: His jacket looks like it came out of my grandmother’s wardrobe. It seems the granny look is in with the dudes this year. Now that that’s out there, I am down with everything else. The pants fit great, the sweater-vest…AH! I love sweater-vests! And don’t you dare step on his blue suede shoes. Joy: This jacket would look great… on me. Picture it – navy dress with gold shoes and big gold earrings. Why did he get to this jacket before me? Do you think he would let me borrow it? Gustavo: This barely merits a comment. It’s boring in every way except the accent points (pants, ankles). The clothes are nice but not put together very well. Mike: I’m going to have a hard time finding anything I like about this guy’s clothes because he looks so unhappy. The clothes don’t make the man, the smile does and this guy needs help in that area more than he needs wardrobe help. Did the photographer tell him to try and look like that? I like the shoes. I like the pants. I like pants that have comfortable linings. But it looks silly to roll the pants up to show the strangely patterned linings. The pants don’t look too long. Why are they rolled up, unless this guy just wants to be noticed for his fancy pant linings? The cardigan and the shirt don’t look comfortable together. They look like they bunch up whenever he tries to move. Maybe that’s why he’s so unhappy. And the cuffs – I can’t tell if those are from the shirt or the cardigan but they look like those 1970’s multicolored sweatbands around his wrists if you just glance at them. Cardigans in general are odd to me. Why not just wear a sweater or a jacket? So you need some extra warmth, but covering up that little triangle area in the middle of your chest would just be too warm? I get that you can take them on and off easily but you can do the same with a jacket or a sweater. Cardigans evidence a lack of decisiveness. Jessie: If you’re going to turn up the cuffs on your pants, do it like THIS guy. First off, his pants STILL touch his shoes, a big plus in my eyes, and second, he’s giving us just a flash of his inner-fashionista with that glimpse of plaid. The sweater, I was almost alright with until I saw the 80’s sweatband-looking sleeve cuffs, in patriotic red, white and blue. Ehhhh…he’s still okay. I like his shoes. Joy: Does he have wrist sweat bands on? Do wrists even sweat? I didn’t realize that graphic design was that strenuous. Gustavo: This is a pretty sharp casual/day look. Sophisticated use of materials and doesn’t look too young or too old. The rolled sleeves make it a little more fashionable. Mike: I like this, but are those pearl snaps on that shirt? Simple belt, looks good. Comfy looking pants from what I can see. I wear my dress shirts with the sleeves rolled up all the time because I don’t like my sleeves being tight around my wrists when I am trying to work and don’t like them catching on things. So I get rolling up your sleeves, but rolling up the jacket sleeves to show the liner and not rolling up the shirt sleeves seems like he got halfway through rolling up his sleeves and then got sidetracked. Roll everything up out of the way and get to work or don’t roll them up. Doing it this way seems too “I’m going for a look” for a regular guy. Also, when I think of a sport coat I think of a piece of clothing that sort of dresses up an outfit a little. I’m not sure you can “dress up” a western looking pearl snap plaid shirt, no matter what you put on over it. Jessie: I like this a lot. 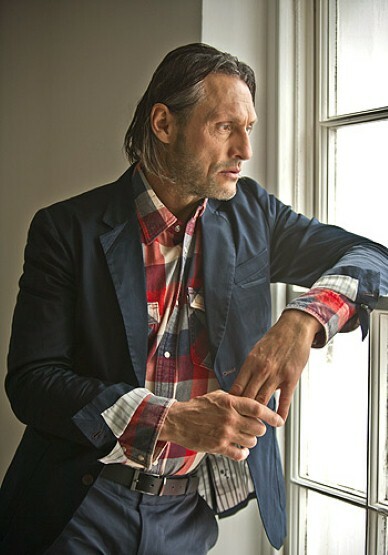 He mixes working-man flannel with business-man suit jacket and fashion-man sleeve-cuff-pop. And it WORKS. Or maybe he just looks too sad for me to be mean. But I’m pretty sure I just like it. Joy: Count on the carpet fitter to have a perfect man outfit. I like men who can work with their hands and use a few simple pieces to look polished but capable of performing random acts of handi-ness. I am from Conroe after all. Mike: That is certainly a lot of bright yellow for a guy to be wearing. It’s sort of blinding. They can probably see it from the space shuttle, if we still had space shuttles. The golf shirt buttoned up to the top always seems strange to me. It’s casual clothing right? So why button it up to your neck as if you are going to wear a tie with it. When I see people with this look I wonder if they really just can’t even relax while golfing. It looks even odder on this guy because he’s got a very long neck. The jeans look pretty good. If it’s raining cats and dogs, or he’s selling fish sticks, the jacket, I suppose, is perfect. 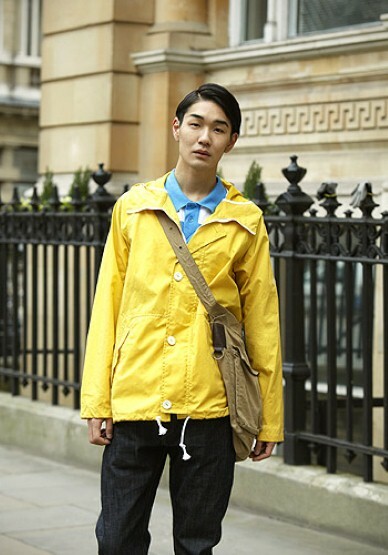 It could be the rather severe hair part, but the bright yellow raincoat and buttoned-up collar aren’t helping – this person has the look of someone people are going to take milk money from. Jessie: My first thought here was that he looks like a kindergartener whose mom dressed him for school. But maybe that’s because I was in kindergarten when the bold, bright-striped polo shirts were really in. That said, HIS man-purse looks like a MAN’S purse, and meets with my approval. Also, I’m really into dark-rinse jeans on guys, so he gets my thumbs-up there, too. Joy: I am not into outfits that resemble Paddington Bear. Need I go on? Enjoyed everyone’s comment. So interesting everyone’s different view. Dad was mostly in tune with Mike’s comments be that good or bad. Dad thought Mike seemed to have a more Southern urban aristocratic point of view which he liked. I’m with Jessie if you can’t machine wash it, you shouldn’t wear it. I was disappointed that there were no designer overalls to be commented on.